Anita is the Partner managing the Motor Insurance Practice in the Penang office of Zaid Ibrahim & Co. (a member of ZICO Law). Anita has been actively in practise for the past 17 years and has extensive experience and knowledge on motor insurance and non-motor insurance claims. She has advised and litigated matters pertaining to accident claims, premium claims and also on the area of fire, theft, flood and subrogation matters. She has also extensive experience in civil litigation which includes banking and commercial related matters. Under the guidance of a reputable senior counsel during her pupillage period at Jagjit Singh & Co, she had the privilege of acquiring and mastering the practice of a wide range of technical and contentious matters. Her frequent presence in the Court has exposed her to various temperaments and styles of most judges and practitioners both in Penang and across Malaysia which experience has enabled her to become an astute litigator without compromising her high level of integrity, prudence and mutual respect for the bench and the Bar. Anita started her legal career with Messrs Othman Hashim & Co in Kuala Lumpur in 1999, specializing in motor insurance and non-motor insurance claims. She joined Messrs Tang Khye Kian & Co in Penang in January 2004 specializing in motor insurance claims. 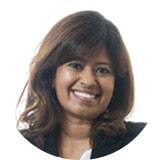 Anita joined the firm in October 2004 and is presently the Partner of the firm based in Penang.